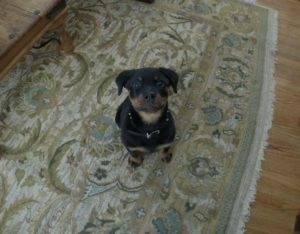 Patrick is a 5 month old Rottweiler puppy, whose owner contacted me for Rottweiler Training Westchester NY. His owner was struggling with his tendency to steal items off the kitchen counter, pulling when on walks, lack of obedience commands, jumping on guests who visit the home, and rough mouthing/biting when he became overexcited. This may sound like a lot of issues, but these are very common struggles for so many dog owners. What Patrick’s owner did that most families do not, is she understood these things need to get rectified NOW, not 6 months or a year down the road. Early training is important for all dogs, but is essential for large strong breeds such as Rottweilers. 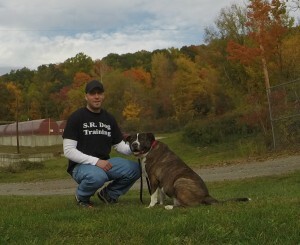 I have worked with hundreds of dogs, across all breeds, ages, sizes, and behavior issues. However, Patrick achieved the fastest results I have ever seen. This is a testament to what proper training can achieve when implemented by dedicated and caring owners. Patrick’s family are experienced Rottweiler owners, who put in the daily work and have the results to prove it. Week 1 – Solved counter surfing, jumping, and taught “Sit”, “Down”, “Come”. Week 2 – Addressed pulling on the leash when out for walks and the “Place” command. Week 3 – We covered how to work Patrick around high levels of distractions, achieve a reliable “Stay”, and longer distance recalls (“Come”) command. Patrick and his owner are the clients that every dog trainer wants… she loves her dog and lives life with her dog. Too many owners simply cohabitate with their dog, living like college roommates in a dorm. That’s not how you should live with your dog, as it does not build a bond and relationship. Patrick’s owner goes out in the world with him – daily walks, trips to the park, plays Fetch in the yard, and practices obedience commands EVERYDAY. Braun is a 13 week old Rottweiler puppy. Their family are savvy dog owners who have owned strong large breed dogs in the past, so they understand the importance of early proper training and its role in having a well-behaved adult dog. 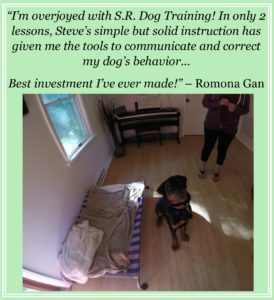 That’s why they contacted me for Rottweiler Training Westchester NY just 5 days after they got him home. In our first training session we covered how to properly housebreak a young puppy, what to expect and how to address puppy biting, and what the daily routine should look like for a 13 week old puppy. It is critical to teach your young puppy how to make appropriate choices and to empower owners with the knowledge of how to raise a happy and well-behaved dog. This is important for ALL dogs, but especially true when you own strong large breed dogs who live with young children in the family.